Reflecting on my decades of managing charrettes, I realized that what I’m really managing is the flow of ideas, information and energy. A key to doing so successfully is the thoughtful use of feedback cycles to establish and maintain a flow of information and ideas among the community and business members and advocates, decision makers, staff, and design team. Information flows at different frequencies between different groups in a multiple-day charrette. Design team members may have multiple interactions happening continuously as they work in close quarters for compressed timeframes, while staff and community members may interact and exchange ideas and information less frequently. 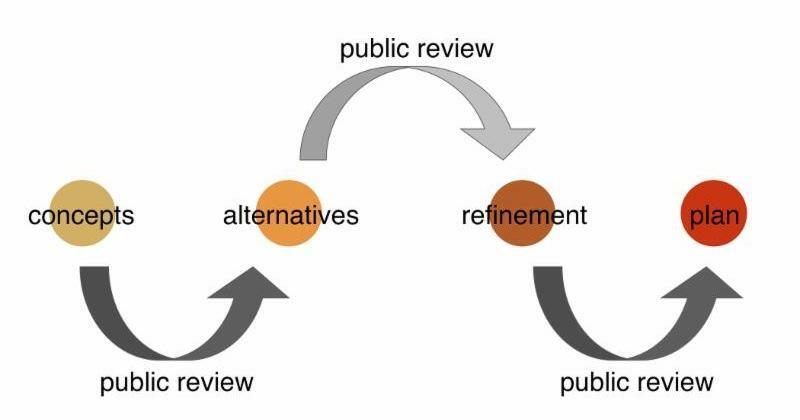 In order to manage the flow of input, ideas and solutions within a community planning process, we find three feedback loops to be the magic number. Three feedback loops allow for a progression from a large set of concepts to a synthesis into a preferred plan. It can take three interactions with a person or group to transform from a position of resistance to a position of listening and then to a position of understanding. Here’s another way to look at it- three feedback loops allow the design team to get it wrong twice before landing on the best idea. Inherent to this process are numerous benefits- by getting it wrong twice, the design team drops their guard. Here openness and listening replace big egos. Participants develop trust in this authentically open design process that seeks the best solution regardless of its source. Shared learning take place during each feedback session among specialists and community members. How do three feedback loops work into a charrette? We recommend that complicated, contentious projects are best served by containing the three feedback loops in a minimum of five contiguous days. The main reason is that five or more days allows the space to deal with the unexpected, yet inevitable, bumps in the political road before they spin out. Less contentious or less complicated projects may qualify for a shorter “Lean Charrette.” (More on that approach in the next newsletter. )The opening night of a charrette is a community workshop focused on information sharing and a vision development exercise. The goal is to develop a shared understanding of the project purpose and process as well as to listen for what is important to the community. The design team then develops a large set of concepts with the involvement of staff and key stakeholders. The first feedback, or pin-up, session happens a day or two later. Here, the design team literally pins an impressive set of concept drawings on the wall. Specialists, project sponsors and community members are engaged in an open conversation about the merits of each proposal. All ideas are reviewed in terms of their strengths and trade-offs are measured against an agreed upon set of metrics. Participants in this pin-up can come away happy, irritated or somewhere in between, which is just fine. The goal is for everyone to be more informed, to appreciate the process and to come back. Unhappy people are often invited to come to the design studio the next day for one-on-one discussions. The design team then moves forward to revise and narrow the concepts down to one or two preferred options. The second feedback loop occurs a day or two later. A similar process commences, with the goal of picking one or two preferred options. Returning participants now see a changed set of concepts in response to their input. This is the point at which people can become hooked on the charrette process. They appreciate that they are involved in a creative process wherein they can have an impact. The cycle continues to the third feedback loop a day later. This time a preferred plan is presented in more detail, usually accompanied by technical feasibility studies such as traffic modeling and financial analysis. By the third go-around, repeat participants (who usually number up to 70%) have been embedded in the design process. They have invested their energy, witnessed the design team’s responsive efforts and are now potential project champions. Of course not everyone gets what he or she wants, but everyone should appreciate how they were treated. It is crucial to match the project process to the type, budget and complexity of the problem. NCI’s Charrette System trainings provide the analytical tools for determining if a project merits a five or more day charrette.